It is winter. The snow deepens on the coastal steppe of the Traskarkka region of northwestern Kangdemar, and the ice closes in on the harbors of its tiny fishing villages, limiting all but a few to narrow passages out to to deeper water - but also generating ice routes to outlying islands, covered in eerie mists. As activity slows to a halt in all but the largest towns, the people follow tradition and ensure that their larders are full, before settling in to await the Celebration of Lords, and the spring thereafter. Things are different now (in the year 322 NG) however, as for the past two years the Skordicans from the northern isles have made regular raids even in the most difficult season. This is a work-in-progress catch-all post for relevant content. I'll be posting more details about the setting and common knowledge sorts of things over the next few days. I'm also using Polycarp's P6 rules where they don't supersede the ones I've already listed (e.g. E10 instead of E6). Pay particular attention to the feats and skill details. This is an experimental use of E10 instead of E6, as I'm still trying to decide the actual power level of the setting. Although not quite as cold and unforgiving as some nearby areas, Traskarkka knows long, dark winters, and its inhabitants spend their summers feverishly stocking larders and preparing their homes to outlast them. As a result, towns take on a quiet demeanor over the winter season, and it is not uncommon for a traveler to ride through a village without seeing more than a single person out and about. The encroaching Skordican war parties have changed this slightly, as the sound of the blacksmith's hammer is heard more often, and an increased amount of armed soldiers is seen passing through to the northern front. Many of these armed travelers are relatively wealthy or of special origin, as the season prevents most from having the means to be conscripted into battle at all (and many are referring to it as the impending "Siege of Silver"). Despite it being a relatively mild winter thanks to the warm currents off of the Ocean of Dragons and the Sea of Palax, many common roads are covered in relatively deep snow, and thus are made more difficult for horses. Those on the move take to mastodons instead, as they can feed off of the pines and do not require large stores of food to be useful, allowing their masters to focus on packing supplies for themselves. Though the true war is not expected to begin until the spring, skirmishes have been attempted a handful of times since the winter began, and the dim glow of countless torches on the distant shore of Whitedome Island puts otherwise-bored knights in garrison on edge. The village of Traskmardt, where the story is set, is a particularly good example of these changes. At a short day's ride from Castle Dakrog (where the main defensive force is fortifying), its people are busier than they ought to be in the early winter, with the blacksmith and fletcher both audible as hard at work late into the evenings. Likewise, the town's Tracker Longhouse is well-lit and offering bounties to those willing to hunt and trap game, deliver messages, and make dangerous journeys close to the hostile force. Though the village is actually under direct control of the Tracker's Guild, Sir Oftro - a knight under Baron Utmati's banner - is lodged with a small contingent of well-trained warriors in a fort overlooking the town from a cliff. A relatively new-looking village, Traskmardt is built among a series of old stone ruins that extend slightly beyond the inhabited limits, leaving a mix of burnt-out, collapsed huts and decaying stone fortifications as a sort of barrier around some of its perimeter. Though it is located at the mouth of the Grey River, and relies heavily on fishing to sustain the town, it has struggled to maintain a dockyard suitable for shipping or other naval purposes since the Great Deluge of 314 NG. During that year, spring ice flows in the river wiped out the largest docks, and subsequent springs have led to moderate damage on the replacements. Most traveling to Traskmardt by land follow the road northwest, crossing a bridge upriver where it is narrower, before following the river down to the coast on its north side. Many of the villagers find work in the new dockyard in Traskmardt's outer cove (ordered by the Marchioness herself, and overseen by Baron Utmati), but also in copper mining, logging (as the village, while located on the coastal steppe, is within a short distance of the forest), fishing, and goat herding. 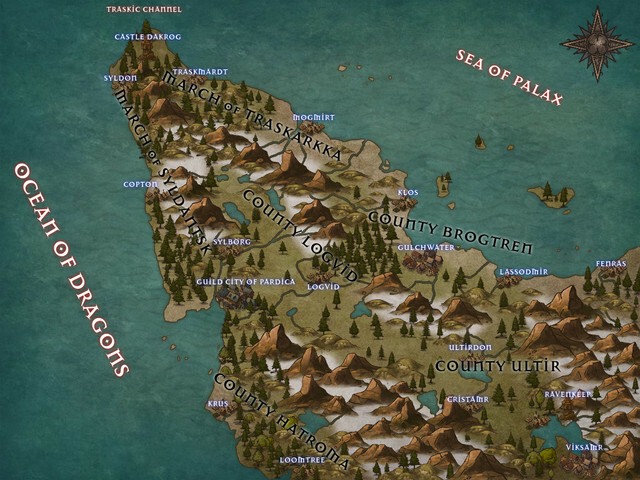 Traskmardt uses a combination of these industries to trade with more inland hamlets that are able to grow some cold-weather crops, and with more distant towns through Mogmirt. 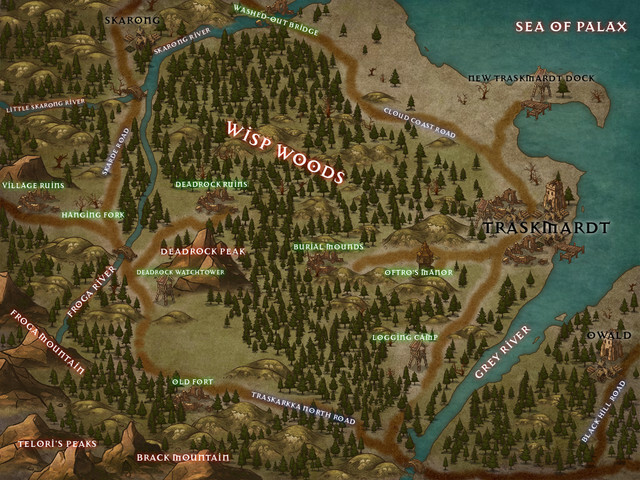 The Kangsaar Tracker's Guild maintains a presence in the town, though they only sport seven full-time members, and as the Guild does not own the area they pay dues to the Baron and the Marchioness via game trapping and guide services. Don't feel like you need to resolve every situation via combat. While we are using a system that is built for this, people don't necessarily want to fight you if there's a bit of contention if the numbers are even, especially in winter. If you get into trouble, another human might find you useful as a prisoner for ransom or otherwise. Remember that your character can't necessarily read - they might be able to understand a few dialects, but your language points are more representative of reading ability than writing. If we get deep into a full campaign, we'll have to iron this out to make it more concrete (and fair). Make sure to ask me questions if you want to know more about the area or cultural norms. 0 HP does not mean dead, for the PCs or any NPCs. If you want to finish them, make sure you do, but be aware that some might look down on killing people who aren't known murderers or of similar wanted-ness. Ability score array is 17, 15, 15, 13, 13, 11. When rolling for HP after 1st-level, if you roll less than half the die size, you can take the half value. For example, if you are rolling a d8 and roll a 1, 2, or 3, it becomes a 4. There is no alignment, and items/spells/abilities that would normally target specific alignments do not exist. If these would normally possess utility against certain enemies that still exist, talk to me and we can work out a modification. All classes receive bonus feats at 1st, 2nd, 4th, 6th, 8th, 10th. This means that Fighters get twice as many bonus feats. No magic items can be purchased. Literacy is not automatic. You are assumed to be incapable of reading and writing unless you spend the points, or belong to specific classes (see the allowed classes list below). If the class you pick has 2 skills/level, bump that to 4 skills per level. Charisma now takes on a reputation-like effect (in addition to its normal bonuses), in that you gain a number of “Contact Points” equal to 5 + your character’s starting Charisma bonus when first created (so for example, a character with 17 Charisma would start with 8 points). Whenever an NPC is encountered for the first time, you can use up one of your Contact Points to declare that your character knows that NPC, and you are then responsible for describing the NPC as well as how you know them. If this is abused I may have to make changes, but this also allows your (and only your) character a +2 bonus to checks related to influencing them in some way the first time you do so (e.g. if it’s a merchant you know from the past, you might be able to convince them to give you a discount on their wares, but only the first time you take them up on the offer). Every time you level up, you gain additional points to spend in this way equal to 1 plus your Charisma modifier (minimum 1). Note that if an NPC is referenced, heralded, or otherwise spoken of before meeting them, the characteristics that they have taken on (e.g. lord of the region, criminal wanted for war crimes) cannot be altered in your description, but you can fill in the details as much as you want, and still have the opportunity to use your character’s familiarity with them in-game with the bonus. Tragodt is the prototypical example of what the many barons of Kangdemar value in their men at arms - only aged 30 years. Famed for his ability to control even the most stubborn mastodon and wield the poorest excuse for a spear, Tragodt is a jaded-yet-loyal member of the local chapter of the Kangsaar Trackers. Appearing as a tall, burly man wearing an iconic black-dyed deer hide over his shoulders, and whose long beard seems to hold frost from the outdoors for unnaturally-long times, he moves about the town of Traskmardt, obsessively tending to the defenses. Having lost both of his sons - one to a botched hunt on a cave lion, and one in the Battle of the Blunt Blades - he has a habit of going to great lengths offering advice to longtime friends and strangers alike. Tragodt is arguably the most experienced hunter that the town possesses, yet he has often refused to leave its limits to help as of late, citing a need to protect the townsfolk against the recent Skordican interlopers. This has increased tension among the local knights, who have challenged him on multiple occasions now that the town's hunting populace has thinned, although the baron has prevented hostilities - for now. A transplant from the war-torn islands of the west, Huwya is a known spellcaster who dwells in a strange abode, built into an overgrown cave in the thin woods at the foot of a nearby mountain. She is a relatively tall, sly-looking woman with dark hair that has begun to show the first hints of gray, and a distinct western islander accent that drops its inflections low. Though she is quick to grow annoyed with nobles who visit her, stories of her magical ire being unleashed upon the townsfolk are largely unfounded. Having emigrated to Kangdemar at the beginning of the Pollock War under the stewardship of Sir Oftro, the warmth between the two is the only exception to her distaste for nobility, and the proximity of her home to his manor leads many to suggest that they maintain an intimate relationship - although one that is becoming strained by the increasing pressure placed on Oftro by his fellow knights, who wish her to use her abilities to aid in the war effort. Huwya maintains a small assortment of herbs and medicines in and around her abode, which are usually given freely to the sick and prove to be expensive if another attempts to purchase them. She is often absent for days at a time, and a great many local myths have arisen about her activities since she arrived five years ago - most notably that much of her home is enchanted with devious traps, and that she keeps tabs on much of the nearby lands through the eyes of crows. If there were ever to be a tournament for the title of most vain noble within Kangdemar, Dame Visildy would almost certainly win it. Having let the fame of slaying the Beast of the Edler Valley (whom tales say was a werewolf, though any evidence of this has not been presented) sink in, she takes a proud and aggressive stance on the defense of the region. Mustering a modest party of nine men-at-arms and Dagnian mercenaries, she has been invited to make base at Castle Dakrog, overlooking the shipwrecks now frozen in the ice along the Traskic Channel. From there, Baron Utmati's total muster (around 350 total knights, professional soldiers, and mercenaries scattered along the Channel) is controlled, and Visildy no doubt makes bold plans for surprise attacks on the occupiers of Whitedome Island. Dame Visildy, despite being in her late forties, is still a fit woman with striking features, standing around 5'7. Usually seen in a dark gambeson and chain shirt, Visildy's hair is wild and hangs all over her gear. With a large wooden shield and spear slung over her back, she bears a simple notched circle pendant (known as a gruchi; a ward against spirits) and gestures strongly with her arms. 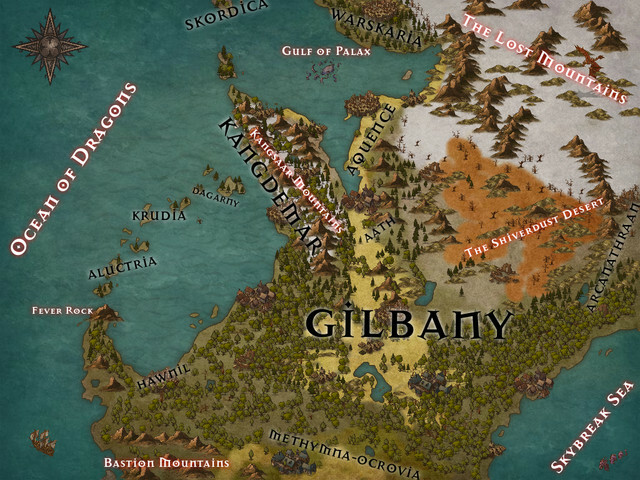 Added a map of the whole region (Kangdemar, Gilbany, neighbors) to the post. Traskarkka will be receiving its own map, but for reference is located along the northeast coast of the country. Also added a bit more about the village, and some general notes about the game. So our first session went pretty well; I'll be posting the logs shortly. I'm not sure that everyone who played will be able to join us in the future, but I would like to schedule some additional sessions on a bi-weekly basis. I'm thinking the best date and time to do this would be Saturdays in the afternoon. The current party consists of a Ranger (archery-focused), Arcanist, Skald, and Oracle. Even assuming that all four players are available in the future, it'd be good to have another player join us, particularly one who plays a tanky type of character. Is there someone out there who might be interested in joining up? If this group is going to continue, it would probably do us some good to address a certain lack of synergy in the party. The Skald's raging song is designed to buff melee guys and wasn't a whole lot of use to an archer and a spellcaster, as such. Should be easy enough to fix, and it could be played up as a flavor difference in the battle songs.